London Bridge’s ancestor dates back to 53 AD and was most likely a military-style wooden bridge. This iteration of the bridge was flattened and destroyed by the rebellion against the Roman rule, led by ferocious warrior queen Boudicca seven years later. A new bridge was designed to match the newly constructed city, 40 years later in 100 AD, and over the next couple centuries, it became well-established as one of the key ports of a city growing in importance. Nearly 2,000 years after its first construction, the bridge is one of the iconic sights of London, and the London Bridge experience maximises on this history and mystery to combine education and entertainment in a form that has received universal acclaim since its opening in 2008. The place’s spooky atmosphere even interrupted construction, with builders refusing to work after they uncovered a collection of skeletons in the crypts. With audio guides for multiple languages, actors resurrecting such figures as Boudicca, the Vikings and the Romans, The London Bridge Experience utilises its location to tell the full history of London, sparing none of the gory details! How do I use my London Bridge Experience voucher? Check out the Schools & Groups section for all the best savings on group outings. How long does a London Bridge Experience show last? The show lasts approximately one hour, though you should make allowances for a little more time as the show is subject to time fluctuations. Late admission is not possible, so ensure you’re on time. Do London Bridge Experience accept the London Pass? Absolutely! No need to buy a ticket, just show up with your London Pass. When’s the best time to visit to avoid queues at the London Bridge Experience? Peak times are between 11am and 3pm, but the popularity of the attraction means there may be a queue at any point. Call on 0207 403 6333 or fill in London Bridge Experience's contact form. Get lost in the gore and gristle of England’s bloody history and tap into some of the deepest and darkest secrets of London at the London Bridge Experience. You can explore the murkiest mysteries of the past at a bargain price with your London Bridge Experience voucher. As top trained actors lead you through the haunted tombs and the help you recreate the horrors that have taken place, you’ll learn the spookiest stains on London’s name. The site of the London Bridge Experience is the historic Tooley Street, which has been host to a flurry of famous residents, including the poet John Keats, and the author George Orwell, when he was researching poverty first-hand back in the 1930s. Steeped in history, the street was the site of a battle between the Norwegian king Olaf and the legendary King Cnut the great, way back in 1013. As one of the most ancient streets in the city, it is bound to be packed with murky memories and spooky spirits. 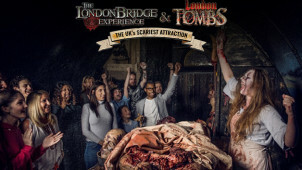 The London Bridge Experience is the brother attraction of the London Tombs, which takes you under the bridge for an extra-scary adventure. This spooky attraction is built in the remains of a former plague pit and is included in the price, which you can save on with your London Bridge Experience offer. With a stunning seven consecutive years as recipients of the award for ‘Best Year Round Scare Attraction’ at the Screamie Awards, you’d better brace yourself before you go in though!